German red cabbage is a popular side dish in the German-speaking countries. In fact, it’s a traditional side dish in Bavaria and Austria. This healthier side dish can be easily recreated at home, just follow the from scratch recipe with the step by step pictures further below. 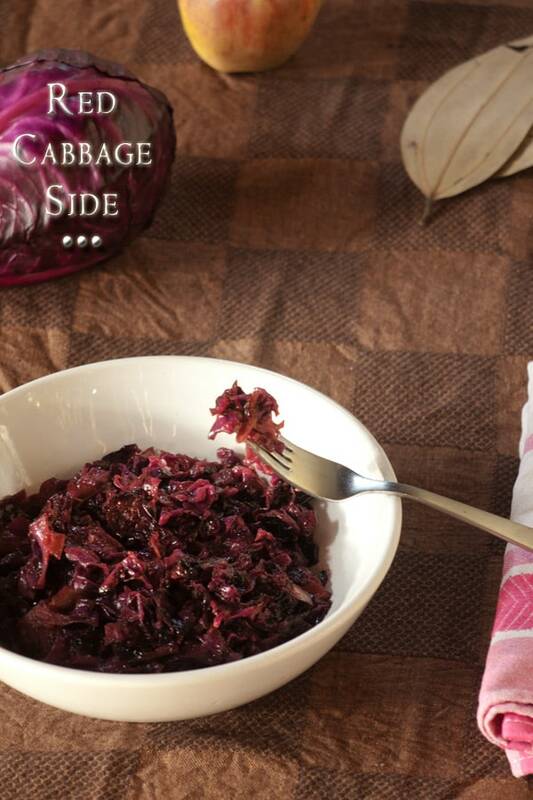 The German red cabbage side dish is a common sight in any of the households in central Europe. Locals don’t call it German in the Alps, it’s mostly just known as “Rotkraut Beilage” – which translates to red cabbage side dish. This must make end of harvest side dish is commonly served during autumn and winter with several different proteins. In the mountains, you can have it served with beautifully prepared wild game meat such as rabbit. However, my favorite choice to enjoy and combine red cabbage with is definitely deer or bore meat! 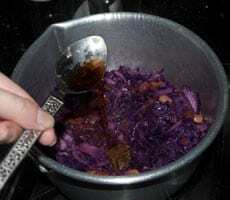 You can visit mountain ins known as Alms or one of the traditional Gasthaus inns, when visiting central European countries including Austria and the neighboring free state Bavaria (Germany) and South Tyrol (Italy), if you want to experience the real authentic soul of this red cabbage side dish. Austria regional, Tyrol travel Tip: The Restaurant Auracher Löchl in Kufstein serves outrageously good red cabbage and other local goodies! Or you could just follow the recipe further below to bring a breeze of my culture into your home. You prepare the sweet and sour German red cabbage by adding mellow spices such as whole cloves, bay leaves, and juniper seeds. 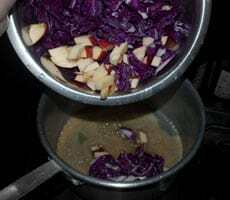 The German red cabbage is easy to prepare from scratch side dish flavored with apple. It won’t take much of your food preparation time. Also, the side dish is gluten-free, nut-free and lactose-free. 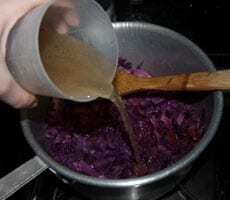 How to serve the German Red Cabbage? You can pair the red cabbage with a wild game, pork, beef or fish dish. I personally don’t think it would make sense to serve the red cabbage side with chicken or turkey but if you enjoy it that way, go ahead! Oh and Vegetarians can always serve the vegetable side with Knödel dumplings or you could enjoy the vegetable delight with some mash potato. 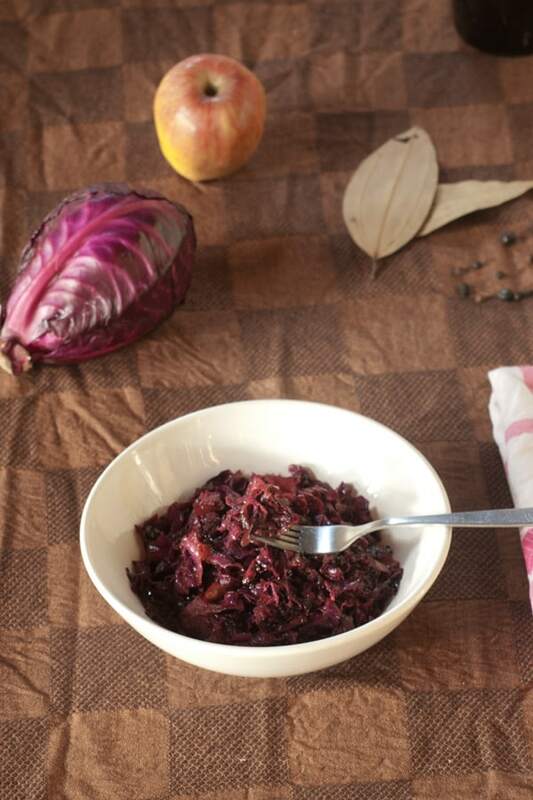 A gorgeous deep purple/red, sweet & sour German red cabbage side dish. Prepare and serve it with a Proteins of your choice. Discard the outer leafs of the red cabbage and wash well under running water. Cut off and discard the stump end. Quarter and slice your red cabbage. Keep aside in a bowl. Wash your apple well under running water and discard the core. Cut into smaller cubes. Keep aside together with the red cabbage. 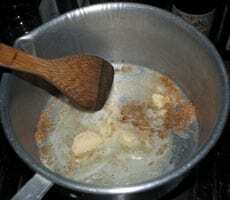 In a pot add the butter and brown sugar. Heat up on slow heat and allow the ingredients to melt but don't burn the butter and sugar. 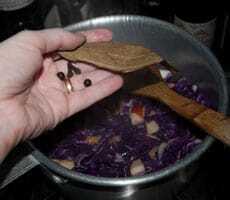 Continue to add in the red cabbage and apple pieces. Stir fry for a minute. Throw in the spices, cloves, bay leaf and juniper seeds. 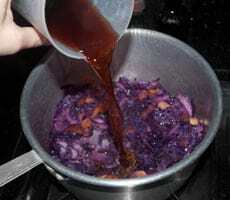 De-glaze by pouring into the cooking cabbage the red wine and the wine vinegar. Let it cook for 1-2 minutes or until it's warm again then add the veg stock and season with salt and pepper. Braise for about 30 minutes on slow heat and make sure to control frequently if there is enough liquid, in case you can add 50 to 100 milliliter of water to keep the braising cabbage moist. The cabbage should be soft moist but not soggy. Pick-out the whole spices and discard before serving hot. Serve hot as a side with Pork, Beef, Wild game, fish or/and Knödel dumplings and/or butter potatoes. 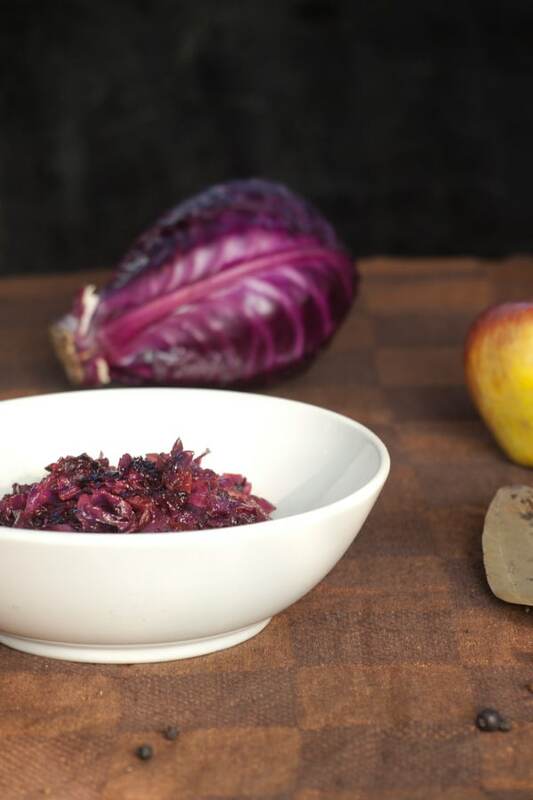 Dear Reader, how would you serve this German red cabbage? Fantastic! That is something we also cook here in Switzerland. I love red cabbage prepared in that manner. I read somewhere that children are more sensitive to “bitter” and “sour” flavors than adults. Not only that, because they are smaller, their tongues are also smaller, which means the nodes (or whatever) that are flavor receptors are closer together, intensifying flavors, particularly bitter ones. One reason why many children, although they like chocolate, don’t much like really dark chocolate – too bitter. Anyway, this is such a lovely way to use red cabbage! Really flavorful. Something I probably would not have liked as a child, but would gobble up now! I just love red cabbage, German-style!! Your photo and post caught my attention and now I’m craving this. It will be a part of my family’s holiday meals. Now I really like it but you still won’t find me eating boiled cabbage. I’d eat this red cabbage dish in a heartbeat though! I just popped in to wish you a Happy Birthday and it looks like I’m the one getting the present! I love red cabbage but funny thing is, it wasn’t something I ever had as a child. The only cabbage I remember having is stuffed!!! This sure looks good! Thank you so much for sharing and a very happy Birthday to YOU! I had some raw red cabbage the other day…love your braised version..so much more flavourful! Funny, but there are so many things that I ate when I was a kid that I no longer like as an adult. My sons, too. But one thing I have always loved is cabbage in almost any form. I love the sweet and sour side to this salad and can see it served slightly warm in the winter and cool in the summer for a picnic. Beautiful! I hated so many vegetables, it’s not even funny. I remember dad would threaten me and sit next to me until I finished the vegetables. The worst of all was eggplant and okra. Surprisingly, I love every kind of vegetable now and I love this braised cabbage. I love red cabbage, but never had a recipe that sounded good to me. 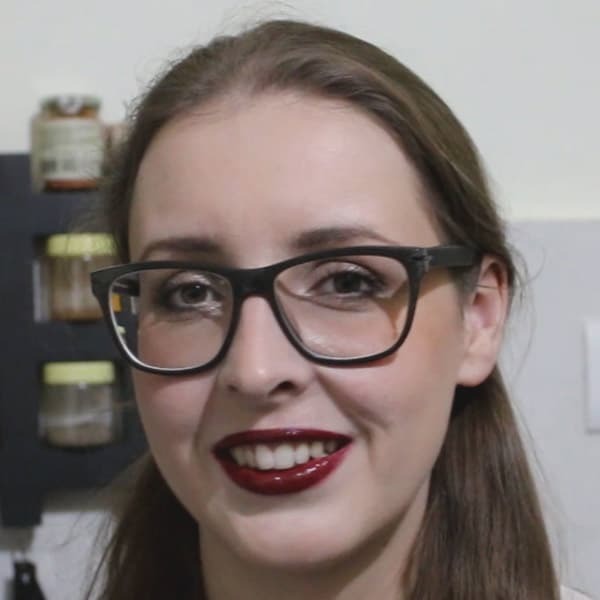 Your recipe sounds delicious! I will be trying this soon. I loved the red cabbage at the very popular restaurant in Chicago, The Berghoff. Thanks for this recipe! My recipe is similar but I either use bacon or schmaltz instead of butter. And I add a few more juniper berries–they are important. 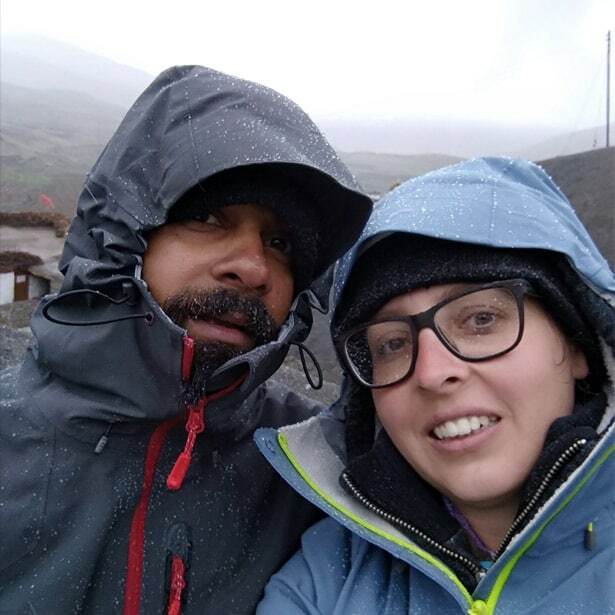 Liebe Helene – why did I always think you lived in Goa???? Rotkraut, red cabbage etc. we eat at least once a week even here in Kerala – mainly with Pork, also chicken, and boiled potatoes, Spaetzle or Oberschlesische Kloesse. And I assure you, it is too a very traditional side dish in Germany!!!. Well I do live in Goa but right now I am in Europe for another month. 🙂 I make Austrian/German food in Goa too but not when it gets too hot, I prefer this cuisine in winter in Goa. Now you need to tell me more about the Oberschlesische Klösse! 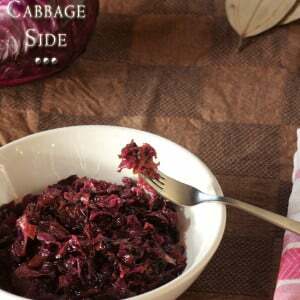 Hi, this may be interesting you: German Red Cabbage Recipe with Apple - Braised Cabbage Side Dish!